Last night right before I was going to drop off into my REM sleep mode, I decided to plug in to the Kindle one more time and there in the email box there was a tweet from my new cyberweb friend, Tammy – what a delight this gal is and I enjoy her writing because she keeps it real. I love real! Back to the point – I saw the FMF word prompt – WORLD! Of course my mind went racing yet, a post did not come to me, instead I went into a deep sleep. 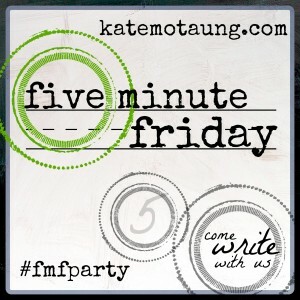 You can visit Kate Motaung’s Five Minute Friday here! 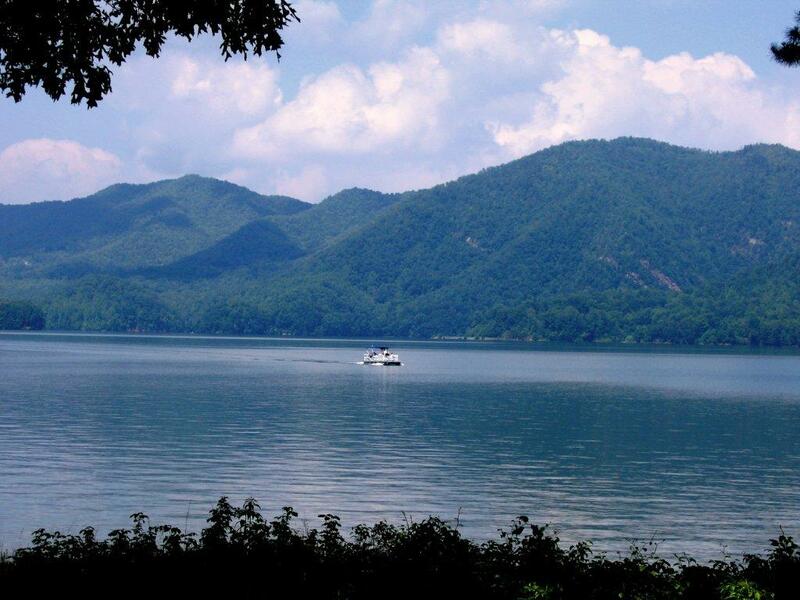 For the last several years I have had an inner longing to move away from our beautiful mountain home and find a new nest on a body of water. I wanted the peace and tranquility of a lake or pond as my front yard. I dreamed of a dock. A canoe. Adirondack chairs. A fire pit waterside. Simon fishing. 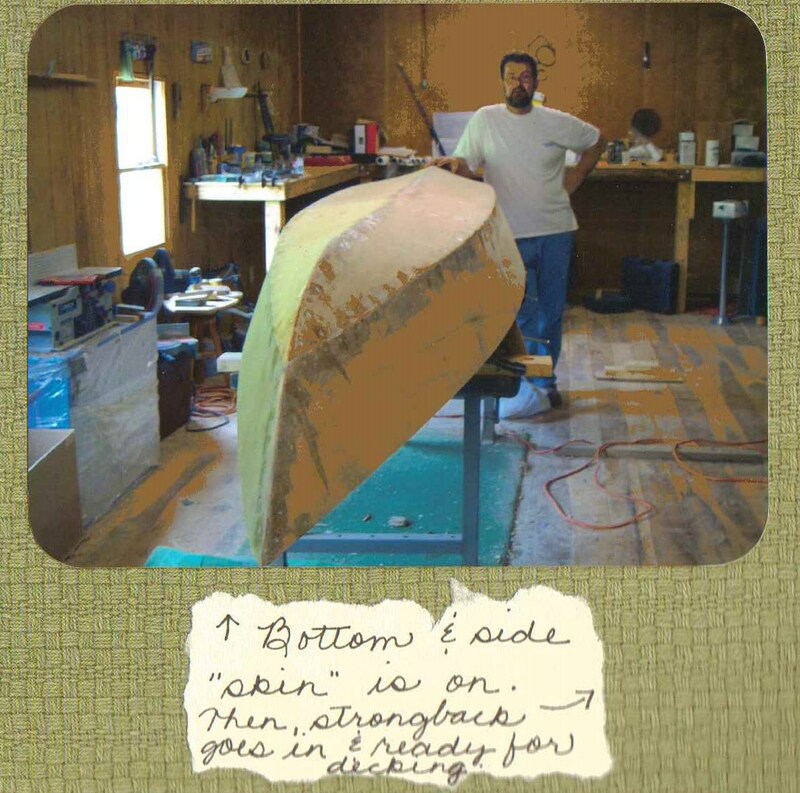 Hubs sailing his hand-crafted outrigger. The yearning was eating me up. I prayed. I sought the Lord. I pleaded. I begged. You get the picture – it got ugly. THEN, I prayed for contentment in where I was, NOT where I wanted to be. And, like The God He Is, He provided that to me. You get the picture – it got ugly. THEN, I prayed for contentment in where I was NOT where I wanted to be. And, like The God He Is, He provided that to me. 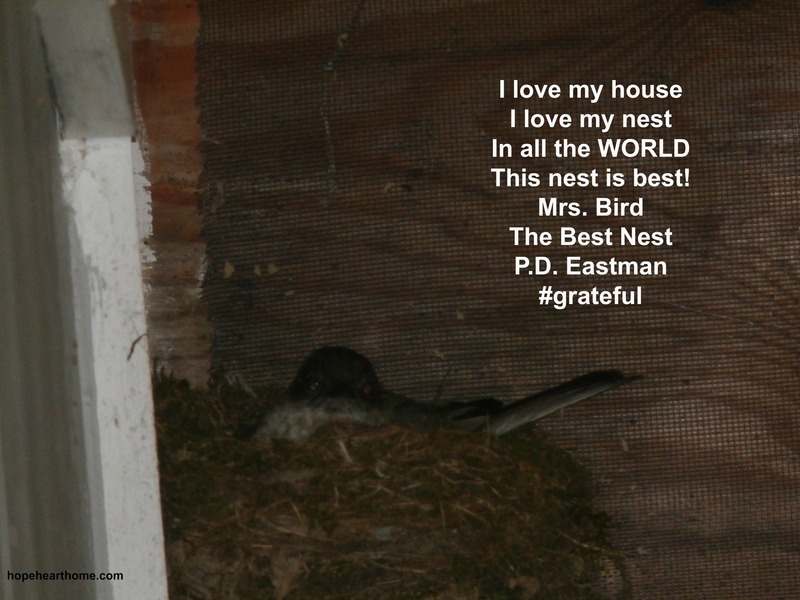 I love my house, I love my nest, in all the WORLD, this nest is best! Linking up with Kate and the Five Minute Friday Tribe is one of the highlights of my week. An awesome group of writers challenging themselves to impromptu write for five minutes on one word topic. Crazy fun! Ah, I LOVE this! I mean love it. Your poem is so comforting and homey. Your mountainside picture gorgeous. I live in the mountains too (WV). I want to live in Florida. Instead, I get to visit Florida almost monthly due to hub’s job there. So, God had a different plan than me! 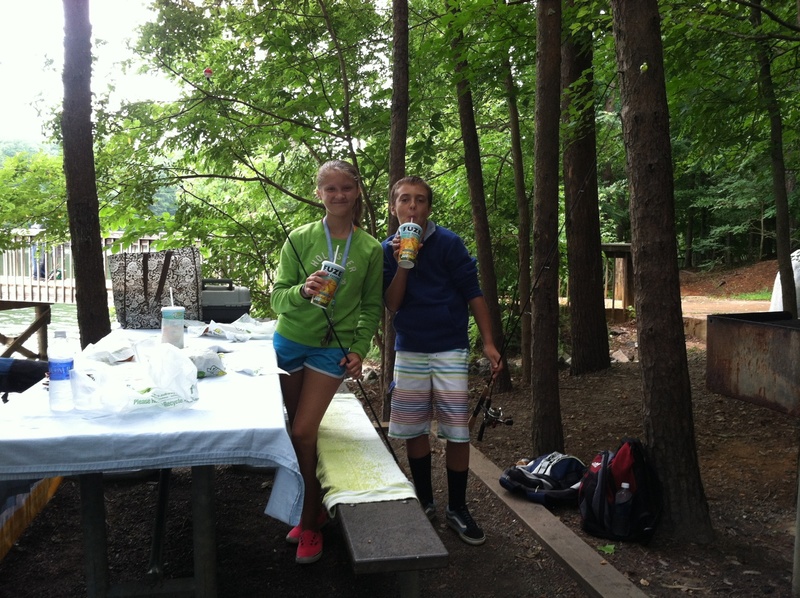 Thanks for sharing your thoughts on FMF! I’m your neighbor! Ruthie, thanks for the visit – I’ll be right over from #41 – I’d love a cuppa when I get there! Hi Rachel – it’s good for us to learn contentment (with great gain!). Thanks for visiting. Contentment is such a hard lesson! But it’s amazing how a change in perspective can change your whole world. Oh Melissa! One of life’s hardest. I LOVE how you started your writing with that wonderful piece of children’s literature! It made my heart sing! I could hear the longing in your writing of a place on the water, but love how you gave your longing and striving to God because you know His perfect peace and realized you were starting to leave it. God is so good. Love that you have your contentment again. Happy endings are the best! Oh Erin YES!!! Thanks for the visit. Oh and you are so sweet to mention me. I’m glad my tweet didn’t wake you. You weekly encourage me when I haven’t linked up. You are so welcoming. Sometimes it is so hard to be content. But the truth is that God does provide. I think of the words “Be still and know that I am God.” Beautiful post friend! Tara, thank you, beautiful friend! Really like this! My hubby and I have been kicking around home improvement ideas lately. Some things really do need to be done (like new carpet) but I have to be careful because it’s a very short road to discontentment. The important thing is not that I have the fanciest home in the world, but that I enjoy the one He’s given me. Good words! As The Nester says, “It doesn’t have to be perfect to be beautiful!” She is so right! Ah yes… sometimes we forget this, don’t we? To be content and happy and at peace with where we are! It offers such joy when we remember! Great post! Such a beautiful reminder Susan! How easy it is fall into being discontent!!! I love that you had the wisdom to pray for contentment with where you are at not dwelling on where you wanted to be! Tara, stubborn me – it took me a lot longer than it should have! Hey Susan! You are wise woman. Don’t give up on your dream. They come true in the Lord’s timing. 27 years ago, I visited Arizona and thought I would move there. 27 years later, I am! Yay! you! Michelle, going to Arizona!!! God certainly has us exactly where He wants us, doesn’t He? Time and time again we look to the world and what others have and become dissatisfied instead of being content right where we are! Happy weekend friend and I love your pictures! Another post straight from my heart 😉 I must say, I came to this decision long ago…but when I’m ‘offered a seat on the bus’ to water-I take it! Love your insights.